1. Flatten chicken breasts, season with salt and pepper, and brush with mustard. 2. Pan grill flattened chicken in little oil, then de-glaze with white wine, turn once, until done. And set aside. 3. Melt butter in pan, add al-dente pasta and season with salt, pepper and set side. 4. Combine béchamel white sauce, mustard, all-purpose cream and chicken stock into sauce pot until creamy. 5. Place pasta on a plate, and top with GRILLED CHICKEN SLICES and pour mustard cream sauce. 6. 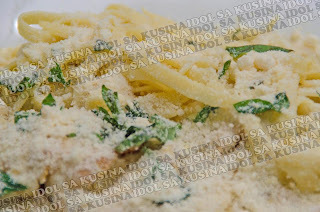 Sprinkle with chopped fresh basil and parmesan cheese.